Untreated copper-bearing feldspar of beautiful red color is found in nature, but it is extremely rare. Natural red copper andesines are regarded as gems and are highly valuable. The only widely acknowledged natural occurrence is found in the State of Oregon (USA). A further occurrence in Tibet is currently under investigation. The diffusion-treatment of andesine-feldspar with copper transforms yellowish colored feldspar into a beautiful reddish-colored copper-bearing andesine. The recent discovery of treated copper-bearing andesine emerging from laboratories in the last 5 years has challenged the gemological community to find a conclusive test for the identification of this treatment and to distinguish them from the natural gemstone material. Before the question of testing could be addressed, the first challenge was to find natural andesine in the field, particularly from Tibet. Several expeditions to Tibet by various researchers revealed copper-bearing andesine occurrences in Tibet as being "salted". 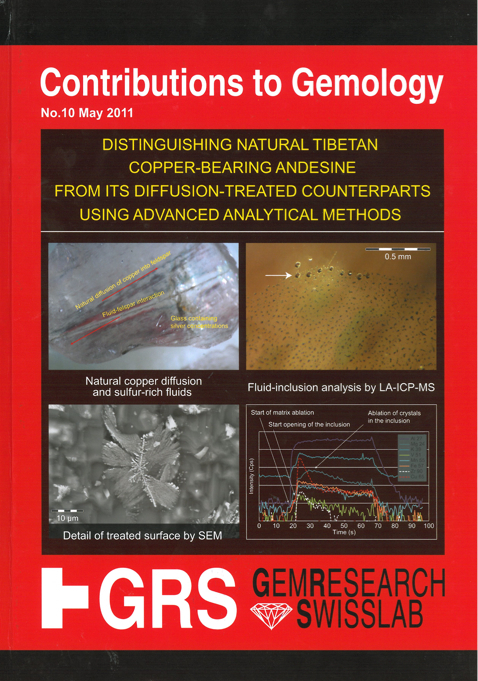 However, in September 2010, another expedition team finally confirmed the natural occurrence of copper-bearing andesine in Tibet approximately 350 km away from the occurrence visited earlier and collected material. Our breakthrough finding consists of a new element proxy (silver) combined with copper isotope measurements using a state of the art femtosecond laser ablation-MC-ICP-MS instrument. These analyses were further crosschecked by radiogenic Argon-measurements, crystal structure analyses, and by an extensive suite of further tests including a detailed SEM-study on surface particles and fluid inclusion analyses. The discovery was made in a sample that GRS collected itself. We were able to drill with a laser to open the contained fluid inclusions. It was possible to analyze these fluids, trapped in the andesine when it formed, for "chemical fingerprints". Based on our research we are able to isolate a group of natural copper-bearing Tibetan andesines from the new material, these can be confirmed as authentic and not diffusion-treated. 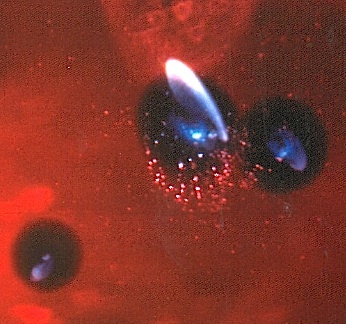 Figure to the left shows a concentration profile across an upper Ya Lin Gu copper-bearing andesine perpendicular to a fluid inclusion trail. Part of the lower left corner was taken off and used for further argon-testing and copper-isotope testing. The two chemical profiles show a pronounced increase of Cu in the area of the fluid inclusions, but an increase in the Ag concentretion towards the rim of the natural syrface of the crystal. The gemstone industry asked that the gemological community make a special effort to end the "andesine controversy" or so-called "andesine fiasco". This report is the summary of our efforts to find a test that can separate natural from diffusion-treated copper-bearing andesines through the investigation of these newly acquired samples whose occurrence is documented. For this, we used the entire repertoire of state-of-the-art analytical techniques that were available at different Swiss Research Groups (University Fribourg, University Berne and ETH Zurich). The unusually large number of gem quality copper-bearing andesine samples in the market seems to be in contrast to the quality and color of copper-andesine collected from the mines. All of the gem-quality copper-bearing andesine from other sources that we have tested recently and that was labeled in the market as untreated materials coming from Tibet ("market stones") did not contain the "elemental fingerprint". Therefore, none of these could be confirmed as authentic materials using non-destructive methods. Since our results allow us to identify natural Tibetan andesine mostly from the locality Yu Lin Gu, it remains unknown where the red, gem-quality materials widely available in the market are coming from, unless destructlve methods can be used for testing. "Paraíba"-tourmaline rough with typical "neon"-blue color from the Quintos mine, Rio Grande do Norte, Brazil. The tourmaline section has been cut perpendicular to the c-axis and polished on both sides. When copper bearing tourmalines were found in the state of Paraíba in Brazil in 1989, they intrigued by their “neon”-blue color and soon became known as “Paraíba” tourmalines in the trade. These tourmalines have become one of the most valuable and sought-after gems, comparable to rubies and sapphires. In the last couple of years an unprecedented tourmaline boom has occurred due to the discovery of new copper-bearing tourmaline deposits. Originally found in the state of Paraíba (Brazil). New mines were subsequently encountered in Rio Grande do Norte in Brazil, as well as in Nigeria and in Mozambique. Multicolored copper-bearing tourmaline in cross section and the trail of craters caused by LA-ICP-MS. Variation in Cu-, Mn- and Bi-concentrations. In the “neo-blue growth zone, the Cu dominates Mn and Bi. A sharp increase in Bi occurs towards the end of the ”neon-blue” growth phase. 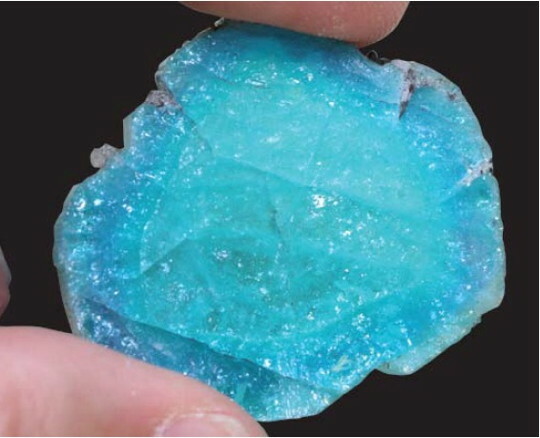 The market and the laboratories were divided on whether to call the newly discovered neon-blue colored tourmalines “cuprian-elbaites” or “Paraíba tourmaline” regardless of origin. While this controversy resulted in a lawsuit, currently dropped, the debate on Paraíba tourmalines moved in a new direction. A suggestion emerged on the Internet and in a seminar at the 2009 Tucson Gem & Mineral Show that Paraíba tourmaline may have been the product of diffusion-treatment. In 2006 GRS has announced it was able to distinguish “Cuprian-Elbaites” from different origins on the basis of chemical compositions. GRS and the laboratory of Inorganic Chemistry and Applied Biochemistry of the ETH Zurich publish the results of this extenive research in this specialized research report. 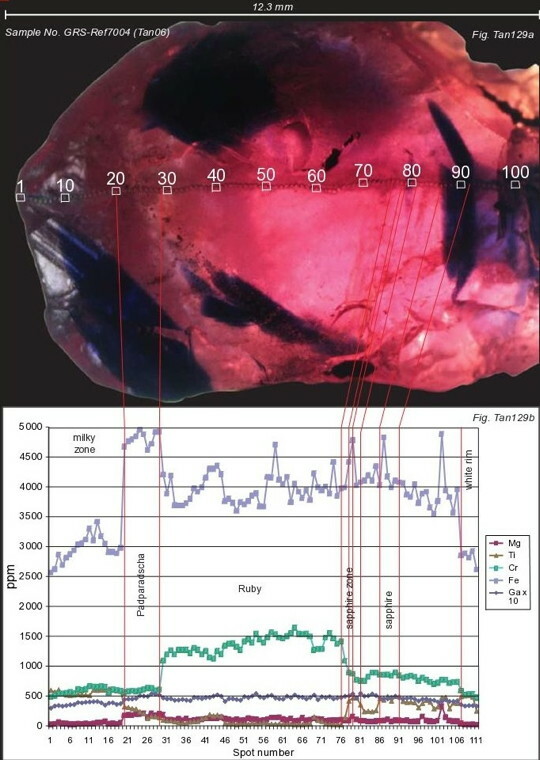 Although some chemical data on the origin of Paraíba tourmalines have been published elsewhere, this study combines the capabilities of several different analytical techniques, concentrating on the analysis of element variations within single crystals of copper-bearing tourmalines, which contain pronounced color zoning and extensive chemical variability. 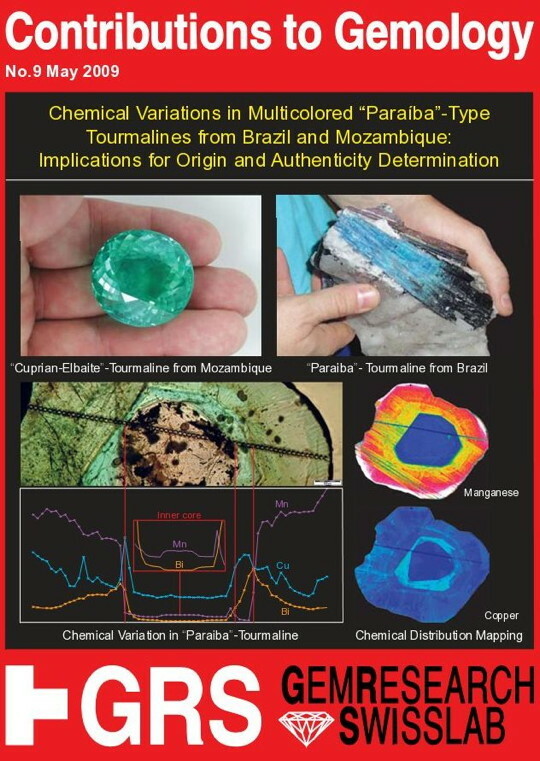 It was possible to solve two different issues at the same time: (1) establish criteria for origin determination of “Paraíba tourmalines” and (2) characterize natural chemical zoning patterns within these tourmalines. This research should prevent confusion between natural “chemical fingerprints” and those resulting from man-made treatment techniques. Overlook on the classical Batalha tourmaline mine in the State of Paraiba, Brazil. View from the top of the "Heitor"-hill towards the direction of Sao Jose da Batalha village. 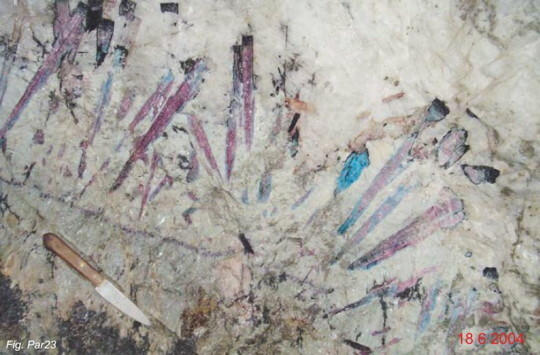 A detailed view of the primary occurrence of copper-bearing tourmalines in the underground host rocks at the Quintos mine, Rio Grande do Northe, Brazil. The tourmaline crystals are growing in sizes larger than pencils. The multicolored tourmalines show a purple core and blue rim. The grey and white minerals of the matrix are quartz and feldspar respectively. Winza Ruby Mine, Tanzania in August 2008. The mine is situated SW of the capital (Dodoma) and can be reached by driving to the local town of Mpwapwa (pronounced "Papua") and by a further 3 hours of driving (in the dry season) to the mining site, locally known as "Winza Mine". Primitive methods were used to mine the sites rather than mechanized large-scale mining. 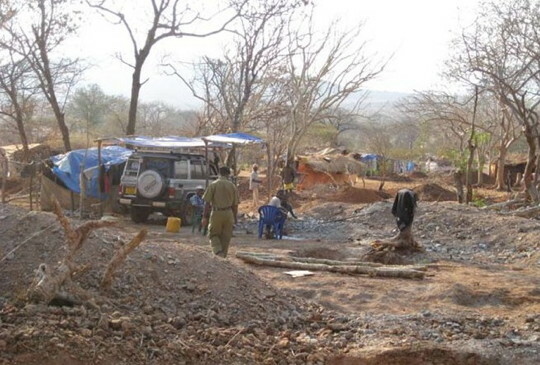 A large number of companies, including gem dealers from Tanzania, Sri Lanka and Thailand established local buying offices in the town of Mpwapwa, about 100 km from the mining site. As a consequence, significant numbers of rubies appeared on the world market in the same year as the discovery. Later that year, production sharply declined as many miners rushed to a gold finding nearby and when it became clear that the simple methods used for mining were not producing any further valuable ruby findings. 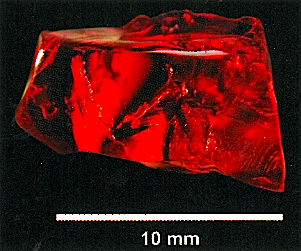 The purpose of this report is to identify these rubies at a critical time when synthetic or heated materials could have been mixed with parcels of “Winza” rubies. It is based on extensive fieldwork and sampling that was only possible after a special permission was granted to GRS by the Tanzanian government and with the support of the Thai and Sri Lankan gem community. 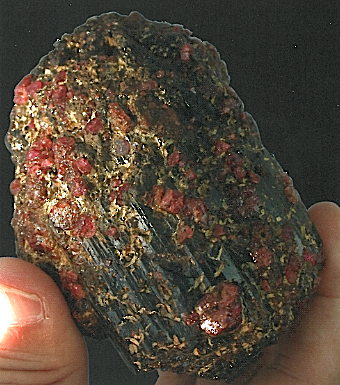 Rough ruby crystal without blue color zoning found in a pargasite-brearing plagiolase-rich rock showing rubies formed in variety of rock types at the mine. 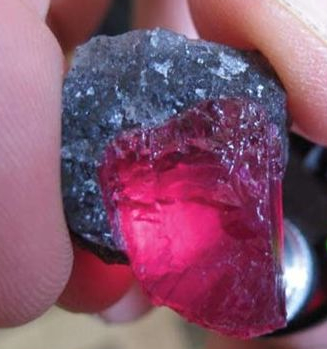 “Winza“-(Dodoma province) rubies can be identified and separated from all synthetic and natural unheated and heated counterparts. The identification can be largely based on inclusion analysis. In special cases, a combination of inclusion analysis with special analytical methods (LA-ICP-MS, UV-VIS-NIR, ED-XRF and FTIR) is needed. Heat-treatment can be identified by a combination of inclusion and FTIR-analyses. 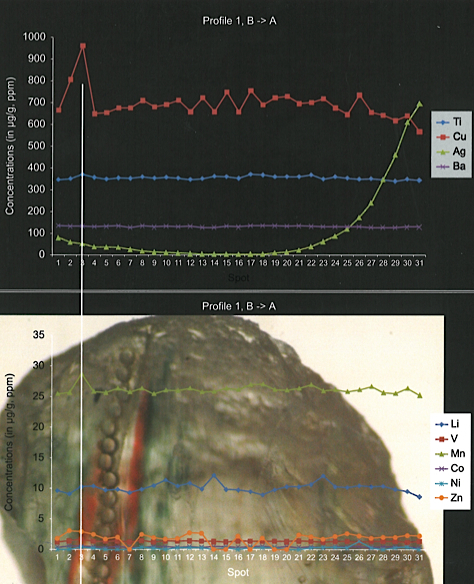 Mg, Ti, Cr, Fe, and Ga(x10) compositional profile of a Winza ruby by LA-ICP-MS. The chemical compositions of the “Winza” Tanzanian rubies are characterized by equal amounts of chromium and iron. 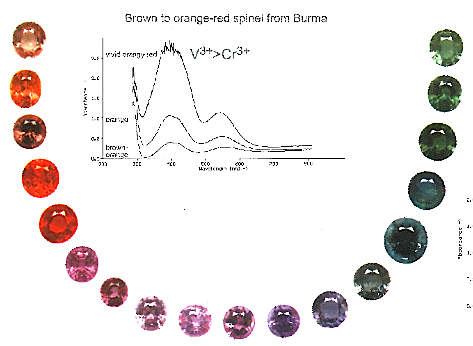 The iron concentrations are slightly lower than those of Thai rubies, but much higher than rubies from marble deposits (Burma, Vietnam, Afghanistan and Tajikistan). Vanadium and gallium concentrations are lower than in rubies from marble deposits (e.g. Burmese rubies). Their chemical compositions can also be used to distinguish between most synthetic rubies, including flame-fusion type, and, with minor exceptions, from Flux and iron-rich synthetic hydrothermal rubies. 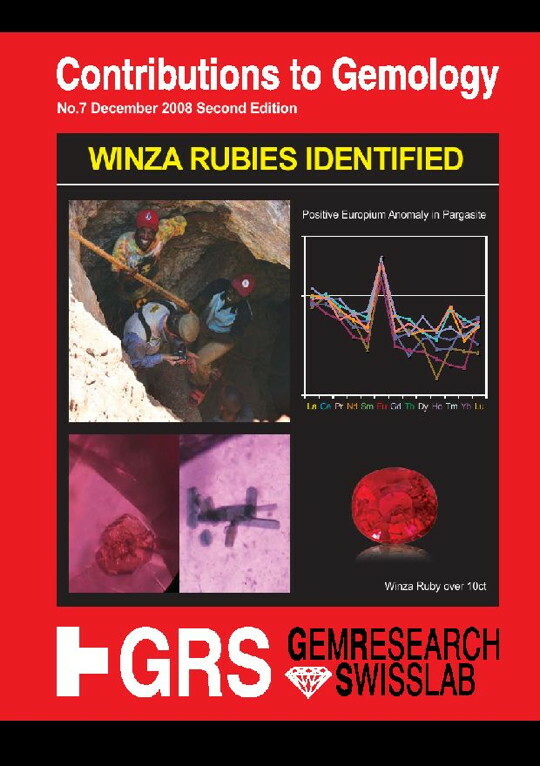 FTIR spectroscopy may be necessary to separate Winza rubies from synthetic counterparts. FTIR spectra revealed a series of OH-absorption lines near 3158 wave numbers. These Infrared absorptions are in general not present in other unheated or heated rubies of other origin. 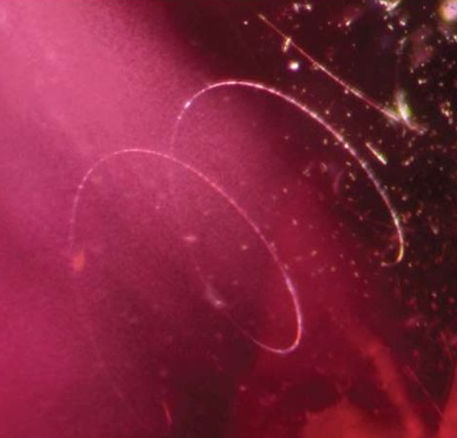 Arching and spiraling needle inclusions found in unheated Winza rubies. The new ruby material contains curved and circled long needle inclusions not found in any other ruby material. These inclusion features can easily be utilized to differentiate between all types of synthetic rubies known so far. The Winza rubies formed in garnet-pargasite-corundum rocks of upper amphibolite to granulite facies metamorphic grade. 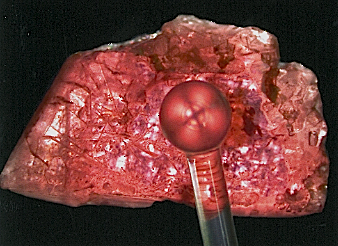 Consequently common ruby inclusions are pargasite and garnet, as well as apatite, whose normalized REE pattern show a prominent positive europium (Eu) anomaly. 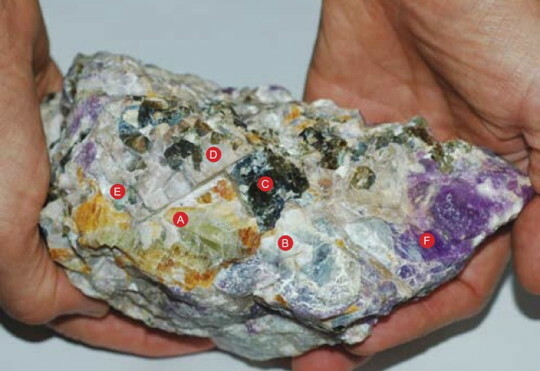 Large pegmatite rock specimen composed of the following minerals: A = johachidolite, B = scapolite, C = phlogopite, D = orthoclase, E = fluorapatite, F = hackmanite. Johachidolite was first described, though with a wrong chemical formula, from the Johachidolite District, Kisshu County, Kankyo Hodu Perfecture, North Korea, and was named after the type locality. In 2001, the worlds first and probably natural, only gem quality johachidolite of 14.02 ct with a possible source in the Mogok area of Myanmar. 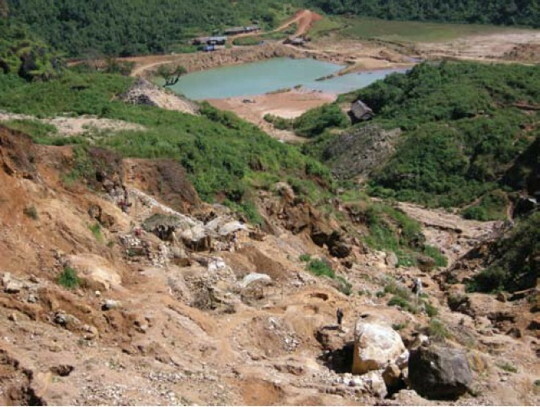 View from Johachidolite-Hill mine towards the alluvial and primary spinel mine at Pyant Gyi which is situated at a lower level. 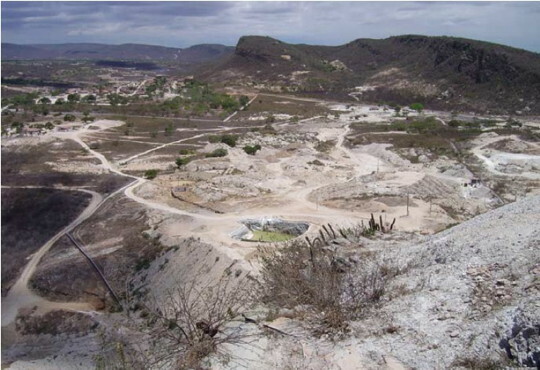 The mining activities are concentrated on small mines which may reach a depth of 50 m or more. Johachidolite is found at the Pyant Gyi mine in the Pain Pyit mining province, which is located about 5 km northeast of Mogok, Burma, Myanmar. Johachidolite is found in a pegmatite consisting of scapolite, hackmanite, orthoclase, fluorapatite, phlogopite, white mica and thorianite-uraninite. 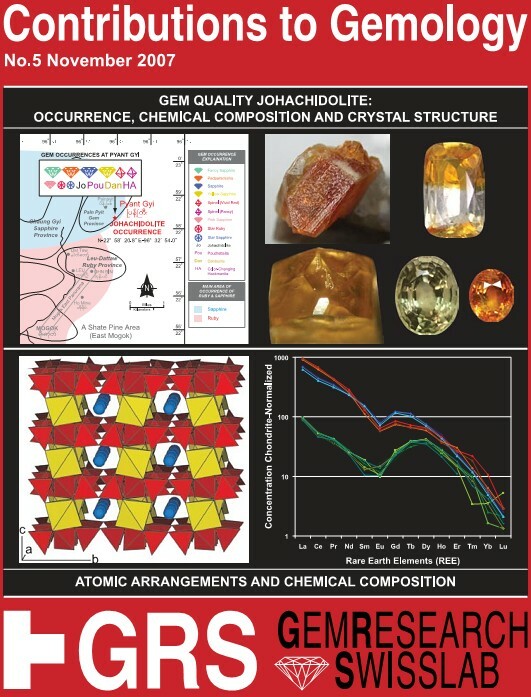 This work describes the effort to trace the origin of the material to the exact mine, collection and analysis of rock samples containing johachidolite, determination of the chemical composition of johachidolite, therestudy the crystal structure of johachidolite using state of the art equipment, identification of more gem quality johachidolite specimens, and data on the chemical composition of the first published johachidolite of 14.02 ct and that proves its natural origin. Sheets formed by BO4 tetrahedra (red) in johachidolite seen edgewise. The sheets are connected by Al octahedra (yellow) sharing edges with BO4 tetrahedra from adjacent sheets above and below; thus strong bonds between the sheets exist. In addition, Ca ions (blue spheres) strengthen the inter-layer linkage. Although, the structure of johachidolite is not based on closest oxygen packing, the ionic arrangement leads to very dense packing responsible for the high average refractive index of 1.720. The strong bonds between the sheets are responsible that no obvious cleavage parallel to the sheets can be observed. 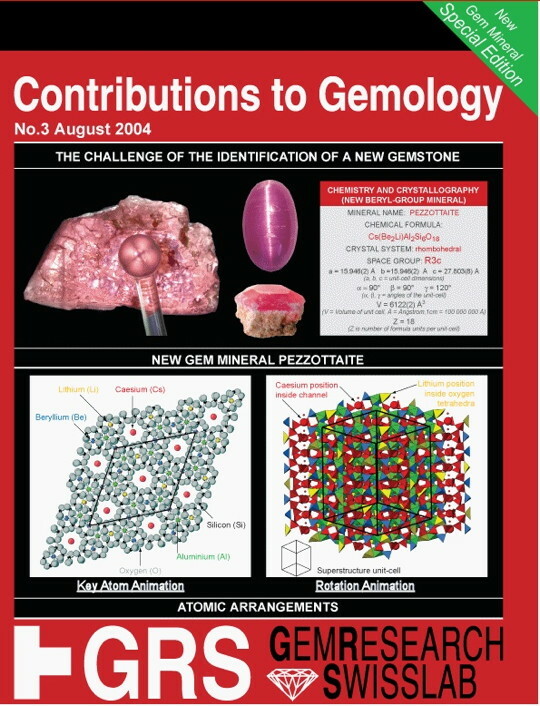 GRS GemResearch Swisslab AG Contributions to Gemology No. 4, December 2005, 65 pp. softbound. Sapphires and rubies of different colors are routinely heat-treated to produce better clarity and color. As long as the treatment does not involve incorporation of color influencing trace elements - such as Ti, Fe and Cr - into the gemstones surface or irradiation, the trade generally accepts the enhanced gem materials as being valuable, depending on size, rarity and beauty. In mid 2001, sapphires and rubies treated with a new method appeared on the market with dominantly orange-pink colors, which are commonly known in the trade as the "Padparadscha" colors. Natural Padparadschas are among the world's most requested, and rarest, gemstones, and therefore highly-priced. Depending on the exact nature of this new enhancement process, and hence the wording used to disclose and supply these sapphires to the market, the price of these materials may vary considerably. Early published reports initiated worldwide speculation on the nature of the treatment, ranging from pure heat treatment to a full blown diffusion treatment. The uncertainty about the exact nature of the treatment method, and therefore the lack of investor confidence, caused the worldwide market for the new sapphire materials to collapse (February - March 2002). Of particular interest to the trade is the question: "Are these new materials diffusion-treated?" Opaque inclusions associated with blue halos in orange-red beryllium-treated sapphire from Songea, Tanzania. This volume is based on an earlier report of the presence of beryllium in these sapphires, and the occasional presence of color zoning confined to the sapphires' facets. A key factor to understand the color mechanism is the use of special analytical methods, such as UV-VIS-NIR (origin of color analyses), ED-XRF (e.g. Iron (Fe), Chromium (Cr) and Titanium (Ti) trace element analyses), SEM-EDS (chemical analyses of contaminated substances at the gemstones' surface), visual and spectroscopic cathodoluminescence investigations (analyses of internal growth structures), color-stability measurements (long-term color-stability to UV and visible light, and, most importantly, Laser Ablation Inductively Coupled Plasma Mass Spectrometry (LA-ICP-MS). The LA-ICP-MS method - used to characterize the content and variation of all trace elements, including light elements such as Lithium (Li), Boron (B) and Beryllium (Be) on a micro scale - turned out to be the key factor in understanding the new heat treatment technique. This report contributes to the understanding of the new heat treatment with Beryllium and to differentiate from conventional heat-enhancement (E) and conventional surface diffusion treatment (T). 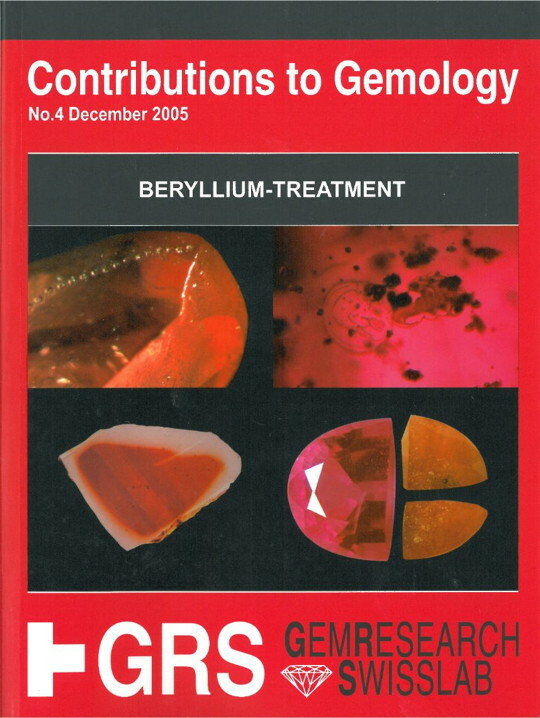 In 2002, a new gem mineral of commercial importance was discovered - pezzottaite of the beryl group. This volume is a case study of identifying and describing a new mineral. The identification of this particular mineral provided two major challenges: (1) the determination of the chemical composition, and (2) the identification of its crystallo structure (the geometrical arrangement of the atoms in three dimensions. Pezzottaite contains several light elements - such as hydrogen, lithium, and beryllium, which cannot be directly analyzed by quantitative methods commonly used for mineral analysis such as electron microprobe (EMPA) or XRF analysis. Instead, measurement by Laser Ablation Mass Spectroscopy, as well as conventional methods used for chemical analysis. Determination of the atomic structure required combination of various analytical techniques was necessary. It was discovered that the unit-cell of had unusually large dimensions, which is best described as a superstructure of beryl. Also, the number of atoms necessary to define the crystal structure turned out to be unusually high in comparison with other beryl- group mineral. Based on the material's composition and structure, it was clear a new mineral had been found. It was named pezzottaite. Pezzottaite shown down the c-axis through crossed polarizers. A projection sphere is introduced to show the material is uniaxial. 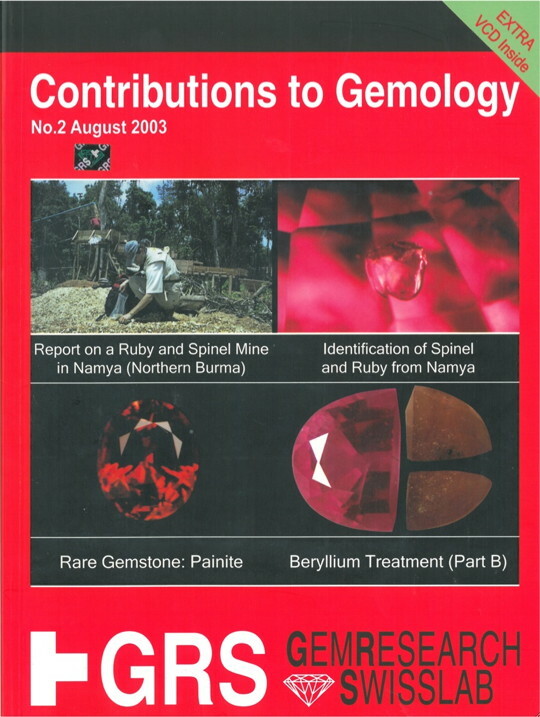 Expedition to the Ruby and Spinel Mines of Namya (Northern Burma/Myanmar) by Adolf Peretti and Anong Kanpraphai. 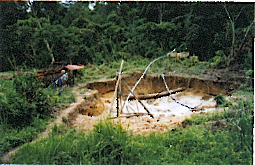 Mine at Sabow Mining Camp, near Namya, Northern Burma/Myanmar. Namya Rubies by Adolf Peretti. Unheated, vivd red ruby, Namya, Northern Burma/Myanmar. Namya Spinel by Adolf Peretti and Detlef Guenter. Spinels from Namya and Mogok almost spanning the entire color spectrum, Burma/Myanmar. New Findings of Rare Collector Gemstone "Painite" from Mogok (Myanmar) by Adolf Peretti. Painite is dichroic and uniaxial as can be seen with the polariscope (parallel and crossed polarizers) and projection sphere. A 3165 carat painite crystal with overgrown rubies, Wet Lu mine, western Mogok, Burma/Myanmar.